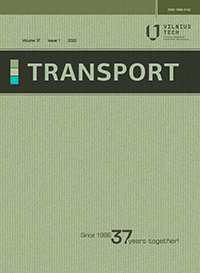 The journal TRANSPORT publishes articles in the fields of: transport policy; fundamentals of the transport system; technology for carrying passengers and freight using road, railway, inland waterways, sea and air transport; technology for multimodal transportation and logistics; loading technology; roads, railways; airports, ports; traffic safety and environment protection; design, manufacture and exploitation of motor vehicles; transport energetics; fuels, lubricants and maintenance materials; teamwork of customs and transport; transport information technologies; transport economics and management; transport standards; transport educology and history, etc. Due to the rapid civil aviation growth, air transportation systems are faced with soaring demands for air travel. However, the increase of the supply of air transportation is much slower than that of its demand, certain conflicts between the demand and supply often occur, leading to airline congestions, passenger-luggage congestions and mixed traffic problems. Therefore, it is of great importance to understand the interplay between the various components of the air traffic system. A sustainable solution for increasing the efficiency of air transportation calls for understanding of air traffic characteristics and effective management methods through appropriate planning and control measures. The objective of this special issue is to serve as a forum for the identification of problems and research trends, the dissemination of novel results and ideas, and the discussion of hot topics in the area of Internet of Vehicles in Intelligent Transportation Systems. The objective of this special issue is to provide a platform for academicians and industry researchers to identify and debate technical problems and recent accomplishments associated with IoV.